Jean-Pierre Aubé was born in Kapuskasing, Ontario, in 1969, and lives and works in Montréal. His interdisciplinary practice (sound performance, media arts, installation and photography) draws on scientific data retrieval methodologies. He has participated in many exhibitions, performance festival and artistic events in Canada and in over 15 countries including: Making Real, Quebec Scene (Ottawa, 2007); Dataesthetics, Nova Gallery (Zagreb, Croatia, 2006); and Electromagnetic Bodies (ZKM, Karlsruhe, Germany, 2005; MadridMedialab, Madrid, Spain, 2006; V2 Rotterdam, Netherlands, 2006). In 2015, in addition to a solo exhibition at RadioArteMobile (Rome, Italy), Aubé performed at the Venice Biennale on the invitation of the Galerie de l’UQAM and the Conseil des arts et des lettres du Québec. Marie-Claire Blais was born in Levis, Quebec, in 1974, and lives and works in Montréal. Blais studied architecture at the Université de Montréal before concentrating full-time on her visual arts practice. Her work in a range of media focuses on experiences of moving through space and the perception of those encounters in memory. Her work has been shown in exhibitions in Québec and Ontario, including at the Musée d’art contemporain de Montréal, Galerie René Blouin in Montreal, and the Diaz Contemporary in Toronto. Pascal Grandmaison, born in 1975, lives and works in Montréal. His photo, film and video works offer poetic meditations on subjects ranging from the portraiture traditions to modernist architecture, while also demonstrating a critical awareness of the mediated nature of representation. Using an analytical perspective and a minimal aesthetic, Grandmaison has made works at varying scales. Since his first major solo survey at the Musée d’art contemporain de Montréal (2006); which toured to the National Gallery of Canada, Ottawa (2007); Grandmaison’s work has been exhibited nationally and internationally, including at Casino Luxembourg – Forum d’art contemporain (2011); at the Art Gallery of Hamilton (2008–2009); and at the Centre culturel canadien, Paris (2012–2013), among others. His videos have been presented at Haus der Kulturen des Welt, Berlin (2012); and at the Edinburgh Art Festival, UK (2014). Grandmaison, a graduate of UQAM, was shortlisted for the 2013 Sobey Art Award. “In the streets of Montréal, the legacy of Expo 67 can be seen in a continuous flow of festivals, but also in sculptural elements, fossilized urban totems─monuments─that range from a finely drawn geometric volume to a catafalque supporting gratuitous and ostentatious technological innovation.” (S. Boudvin) In this photographic project, Simon Boudvin provides us with an inventory of urban echoes of the Universal Exposition, juxtaposed with quotations gleaned from a variety of official Expo 67 documents. Many of these urban structures are very familiar to Montrealers, and their reference back to the pavilions of 1967 underscores the time that has passed, but also highlights the under-recognized impact on our urban landscape of the modern architectural vocabulary that was so present at Expo. Simon Boudvin was born in 1979, in Le Mans, France. He studied at the École nationale supérieure des Beaux-Arts de Paris in the studio of Giuseppe Penone and at the École nationale supérieure d’architecture de Paris-Malaquais. Since 2007 he has taught in several different schools of architecture. Boudvin’s work emerges from both architecture and the visual arts. He investigates the city and its strange constructions, sometimes preparing a detailed statement, sometimes reconstituting, describing or photographing specific elements. In Paris, he is represented by Galerie Jean Brolly, where he has had three shows: Appareils (2015), Legs (2013), et L’Anse brisée (2009). His works have regularly been presented by art centres in France : MRAC, Sérignan (2016); CRAC Alsace, Altkirch (2016); CREDAC, Ivry (2012); Les Églises, Chelles (2011); La Salle de bains, Lyon (2010); and in Europe: Fondation Eugenio Almeida, Évora, Portugal (2017); Kunstraum, Düsseldorf, Germany (2016); Extra City, Antwerp, Belgium (2016) ; Project Art Center, Dublin, UK (2015) ; Form Content, London, UK (2008). International residency programs have led him to work in New York, Seoul, Hanoi and Montreal. Boudvin is collaborating on projects with several architectural firms, including BuildingBuilding in Paris, France and V+ in Brussels, Belgium. Stéphane Gilot’s mini-pavilion functions as a temporary micro-community reflecting on the laboratory of ideas that was Expo, but that regrettably never extended beyond the boundaries of Île Sainte-Hélène and Île Notre-Dame. 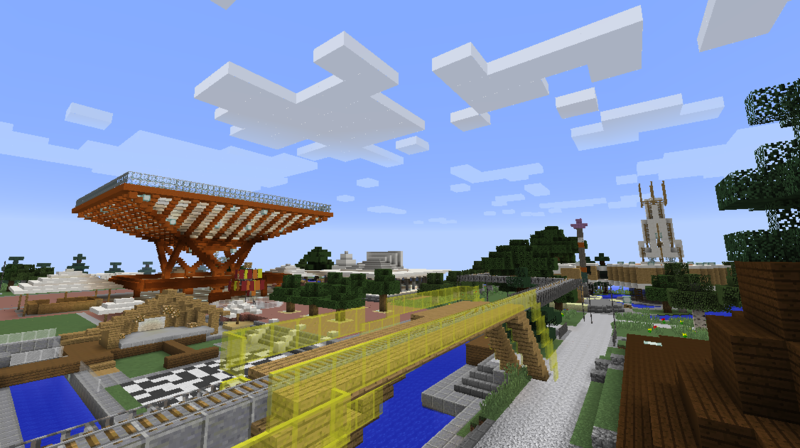 More than a semiotic phantom, the 1967 Universal Exposition, with its huge potential for alternative forms and approaches, is revisited through the Minecraft construction game platform, chosen because of its geometry (cube and vector), freedom of shareable creation (open source code) and concept of resources (limited or unlimited). Visitors are invited to move through and participate in the construction of a virtual world while exploring the vectoral forms of the architecture given prominence at Expo 67: the cube, the triangle and their many variations. The pentagonal shape of the table is a direct reference to Robert Altman’s 1979 film Quintet, shot on the Expo site, in which the social order established by a casino-based government in a post-apocalyptic future is maintained through a game centred on the pentagon. The link with the fate of the Québec and French pavilions, which were converted into a casino, is striking. The musical excerpts are from the works of composers Gilles Tremblay and Iannis Xenakis. Stéphane Gilot, born in 1969 in Belgium, lives and works in Montréal. His multidisciplinary practice combines drawing, models, architectural installations and performance. Among his recent projects are a major solo exhibition, Le catalogue des futurs at the Musée d’art de Joliette (2016); Pièce pour cinq interprètes, lumière rose et silence presented at the 12th Havana Biennale, Cuba (2015); MULTIVERSITÉ/Métacampus at the Galerie de l’UQAM, Montreal (2012); and La Cité performative at the Musée national des beaux-arts du Québec, Québec (2012). He has also shown his works at Art Toronto (2015); at the Musée d’art contemporain de Montréal in the 2008 Québec Triennale; and in Smile Machine at the Berlin Transmediale (2006). Hand-processed 16-mm and Super 8-mm film, and digital video, 9 min 6 s, sound. Hoffman and Kolcze’s project brings archival images into the present, rendering the now-familiar views of the site otherworldly. Photochemical and digital manipulation of images from two films─the souvenir film Expo 67 by Castle Films and the “city symphony” Impressions of Expo 67 by William Brind─are accompanied by Josh Bonnetta’s analogue soundtrack sourced from the original films. By rephotographing the original films onto black-and-white hand-processed celluloid, inverting colours, rendering images in negative and hand tinting, the filmmakers transform the intended meanings, which promoted the optimism and excitement of Expo 67. The film creates vibrant collisions of textures and forms in order to explore the surfaces, ideologies and implications of the “meeting place” that was Expo 67. Eva Kolcze is a Toronto-based artist, filmmaker and educator who creates films and installations based around themes of landscape, architecture and the body. Her work has screened at venues including the National Gallery of Canada, Ottawa (2016); Gardiner Museum, Toronto (2016); Cinémathèque Québécoise, Montréal (2016); Birch Contemporary (Toronto, ON, 2015); Anthology Film Archives, New York City (2013); as well as in many festivals: International Rotterdam Film Festival, Netherlands (2014 – 2016); Oberhausen Film Festival, Germany (2015); and the Images Festival, Toronto (2015 – 2016). She’s also instructed youth and adult filmmaking workshops at the Toronto International Film Festival, York University, Liaison of Independent Filmmakers of Toronto, Harbourfront Centre, and Artscape Gibraltar Point, Toronto. She holds a Bachelor of Fine Art from OCAD University and a Master of Fine Art from York University. Philip Hoffman was born in 1955, in Kitchener-Waterloo, Ontario. Hoffman first became intrigued by questions of reality in photography and later in cinema. He has been honored with more than a dozen retrospectives of his work. In 2001 the publication “Landscape with Shipwreck: First Person Cinema and the Films of Philip Hoffman”, was released comprising some 25 essays. He has received numerous awards including the San Francisco International Film Festival’s Golden Gate Award and the Ann Arbor Film Festival’s Gus Van Sant Award. Hoffman currently teaches at York University, in the Department of Cinema and Media Arts, and since 1994, has been the Artistic Director of the Independent Imaging Retreat (Film Farm). In 2016 Hoffman received the Governor General’s Award in Visual and Media Arts. “Philip Hoffman is one of the few contemporary filmmakers whose work provides a bridge to the classical themes of death, diaspora, memory, and finally, transcendence.” (Martha Rosler). Inspired by the word Katimavik, meaning “meeting place” in Inuktitut, which was the name of the inverted pyramid structure that was part of the Canada Pavilion, Inutiq’s installation is an abstract audiovisual interpretation of the forms, images, symbols and languages that were present in the original pavilion. Inutiq draws on archival sources to create a decidedly contemporary multimedia space using numerous elements: films sourced from the Prelinger Archives of Expo 1967, a language-based work juxtaposing English, French and Inuktitut, digital prints and an audio composition inspired by Canadian electroacoustic composer Otto Joachim’s four-track sound installation, Katimavik, commissioned for the original pavilion. The use of digital technologies to create optical and sonic effects¾crystallization and fragmentation of moving images, serially generated waveforms and magnetic tape recordings, manipulation of printed images¾allows him to inscribe a critical perspective on 1967 as “a pinnacle of the possibilities of futurism and the potentiality of the nation state as an agent of newfangled corporate and technological breakthroughs.” (G. Inutiq). Geronimo Inutiq is of Aboriginal and Québécois ancestry, and an accomplished artist in electronic music composition, multi-media, and video installations. His work reflects on popular and underground electronic music currents and weaves multiple cultural threads and gives space for organic imagery as well as exploring more synthetic sources. He explores digital video and images, treating archival film in the context of museum and art gallery exhibits, alongside his work in electronic music performance, composition, and DJing. His work has been featured in the exhibition Beat Nation, Vancouver Art Gallery (Vancouver, 2012; Canada tour, 2012 – 2014); and performed in the Musée de la civilisation de Québec (2016); Transmediale and Club Transmediale, Berlin; and the imagineNATIVE Film & Media Arts Festival, Toronto. This installation takes as its point of departure the Environment for Creative Play and Learning in the Children’s Creative Centre at Expo 67, an adventure playground designed by the innovative Canadian landscape architect Cornelia Hahn Oberlander. Amongst the glitter and technology-driven view of the future that was characteristic of Expo, this modest plot offered children nearly infinite possibilities for play, with its natural textures, mounds and “loose parts.” The result of detailed on-site and archival research, as well as conversations with Oberlander herself, this installation consists of large hand-tinted digital prints based on archival artifacts and custom-built notched logs that can be manipulated by museum visitors. The multitude of textures, objects and costumes pays tribute to Oberlander’s non-hierarchical definition of “creative power” that challenged conventional notions of children’s play. Leisure attests to Oberlander’s determination and analytical acumen through her correspondence with project director Polly Hill. Acknowledgments: Milieux – Institute for Arts, Culture and Technology, Concordia University; Pan Abode; Matthew Brooks; Gabrielle Doiron. Leisure is a conceptual collaborative art practice between Meredith Carruthers (1975) and Susannah Wesley (1976), based in Montréal. Working together under the name “Leisure” since 2004, they engage with cultural historical narratives through research, conversation, published texts, curatorial projects and art production. Panning For Gold/Walking You Through It which they are developing for In Search of Expo 67 is part Leisure’s ongoing project entitled You must do the moving, exploring ideas around mid-century women and creative production – specifically spatialized movement, gesture, and the use of alternative methodological approaches. Leisure has produced exhibitions and special projects in Canada and abroad, and participated in residencies in Banff (Banff Centre for the Arts, AB, 2007); Dawson City (KIAC, Yukon); Haliburton (Ontario); and Vienna (Kunstverein das weisse haus, Austria, 2008). Their recent research on gesture and spatial narrative has included Dualité / Dualité (Artexte, Montreal, 2015) and Conversations With Magic Stones in 2016 at EFA, New York. Le Huitième Jour is inspired by The Eighth Day, a film created by Québec artist Charles Gagnon as part of the Christian Pavilion, one of three religious pavilions at Expo 67. The film is composed of found newsreel footage, producing a frenetic critique of war technologies, violence and postwar consumerism. Effectively picking up where Gagnon left off, Léonard’s double-screen video installation is a collage of images of conflict from 1967 to the present, gleaned from hundreds of thousands of clips available on the Internet. The documents are sourced from broadcast television, state and military archives, self-promotional recordings by guerillas, as well as the propaganda of various camps. The evolution of technologies is made manifest through the diverse quality and shifting aspect ratios of the projected images, which go from analogue to digital formats, from cellphone recordings to drone captures and infrared detectors. Léonard has chosen to focus on daily activities─marching in step, trudging through the jungle, running, sitting and waiting in makeshift camps, stepping over dead bodies─and to remain at ground level, thereby subverting the high-tech images of war favoured by the military. Emmanuelle Léonard was born in Montréal, where she lives and works. Her work has been presented in many group and solo exhibitions in Canada and in Europe. She participated in the Québec Triennale (2011) and in the Montréal Biennale (2014) at the Musée d’art contemporain de Montréal. Léonard received the Pierre-Ayot Prize in 2005, she was also nominated for the Grange Prize in 2012, and was finalist for the first contemporary art award of the Musée national des beaux-arts du Québec in 2013 and the Louis Comtois Prize in 2014. Duane Linklater, born in 1976, is Omaskêko Cree from Moose Cree First Nation in Northern Ontario and is currently based in North Bay, Ontario. He received his education at the University of Alberta, receiving a Bachelor of Native Studies and a Bachelor of Fine Arts. Linklater attended the Milton Avery Graduate School of Arts at Bard College in upstate New York, completing his Master of Fine Arts in Film and Video. He has exhibited and screened his work nationally and internationally at the Vancouver Art Gallery; the Art Gallery of Alberta, Edmonton; the Family Business Gallery, New York City; The Power Plant Contemporary Art Gallery, Toronto; and in a recent collaboration with Tanya Lukin Linklater at the Museum of Contemporary Canadian Art, Toronto. His collaborative film project with Brian Jungen, Modest Livelihood (2012), was originally presented at the Walter Phillips Gallery, at The Banff Centre in collaboration with dOCUMENTA (13), with subsequent exhibitions of this work at the David Logan Centre Gallery at the University of Chicago; at the Catriona Jeffries Gallery, Vancouver; and at the Art Gallery of Ontario, Toronto. Linklater won the Sobey Art Award in 2013. Documentary filmmaker Caroline Martel and her collaborator, Mathieu Bouchard-Malo, have composed, in their words, a montage of original archival films for the screen mosaic at the Espace culturel Georges-Emile-Lapalme in Place des Arts. Expo 67 is highlighted as an optical amusement park, in a manner similar to how the Italian semiotician Umberto Eco characterized it, and the montage focuses on the interactive, immersive, cinematic, multimedia and multiscreen films projected at Expo, as well as images of La Ronde and the pavilions lit up at night. Through the fragmentation of images on the thirty-five screens, Expo’s vitality and air of innovation are transmitted through an archival lens that is rendered contemporary. Caroline Martel was born in 1973, in Montréal (Québec). Martel is an award-winning documentary filmmaker, artist and researcher whose work has been presented to critical acclaim internationally in diverse venues such as the Toronto International Film Festival, the International Documentary Film Festival Amsterdam, on television networks such as Radio-Canada, Sveriges Television (Sweden) et Japan Broadcasting Corporation (NHK, Japan), at the Museum of Modern Art in New York and at the Centre Georges Pompidou in Paris. Her first feature documentary, The Phantom of the Operator (2004), has known an exceptional trajectory being showed in more than fifty international festivals. Martel was one of the featured guests at the 57th Robert Flaherty Seminar. Her first gallery show, the montage installation Industry/Cinema (2012), was presented at the Museum of the Moving Image in New York. Jacqueline Hoàng Nguyễn, born in 1979 in Montréal, is a research-based artist currently based in Stockholm, Sweden. In 2011 she completed the Whitney’s Independent Study Program, having obtained her MFA and a post-graduate diploma in Critical Studies from the Malmö Art Academy, Sweden, in 2005, and a BFA from Concordia University, Montreal, in 2003. She has been awarded grants and fellowships from the Canada Council; The Banff Centre for the Arts; The Swedish Arts Grants Committee’s International Program for Visual Arts and the Swedish Research and Development Fellowship in the Arts. Recent solo exhibitions include: The New Gallery, Calgary (2015), MAI (Montréal, arts interculturels, 2014); Momenta Art, Brooklyn (2014); Kunstverein Braunschweig, Braunschweig, Germany (2013); VOX: Centre de l’image contemporaine, Montreal (2012). She participated in the Biennale de Montréal (2014); and in other group exhibitions in galleries such as A Space, Toronto (2014); Apexart, New York City, PAVED arts, Saskatoon, and Or Gallery, Vancouver (2013); as well as the Institute of Contemporary Art, Philadelphia (2011). In 2011 she was commissioned by CC Seven to produce a site-specific sound piece for The Woodland Cemetery, a UNESCO World Heritage site in Stockholm. The massive social and political upheavals of the late 1960s were mirrored in the divergent forms of music that emerged at the time, from experimental electronic music to reggae to lounge. All of these came together at Expo, along with more traditional pop and classical music. Citing 1967 as the year in which electronic music as we know it took shape, David Ritter and Kathleen Ritter have produced an audio collage of the sounds of 1967. They sample significant moments such as Marshall McLuhan’s The Medium is the Message; Gilles Tremblay’s electroacoustic composition Centre-élan; the sculptural sound composition of the artist collective Fusion des arts, entitled Les Mécaniques, as well as such diverse sources as the Beatles’ song Strawberry Fields Forever; Steve Reich’s conceptual Piano Phase; Glenn Gould’s radio documentary The Idea of North; the writings of Guy Debord and selected pieces by Delia Derbyshire and Daphne Oram. In this sound installation, the artists examine the acoustic spaces of Expo 67, especially instances where music sampling and repetition were introduced to popular audiences, viewing these as foundational moments that presaged the rise of DJ culture, hip hop and the remix. Kathleen Ritter is an artist and a writer. Working with sound, photography, video, and text, often in collaboration, her practice explores alternative histories, especially in relation to systems of power, language and technology. Her recent solo exhibitions took place at G Gallery, Toronto, and Battat Contemporary, Montréal (2014). In addition, Ritter has organized exhibitions in Canada and abroad, and published writing on the work of contemporary art and artists, including Mark Manders, Pierre Huyghe, Althea Thauberger, Colette Urban, Rachel Harrison, Derek Sullivan, and Ai Weiwei, to name a few, and on subjects as diverse as hip hop, precarious labour, public art, revolution and visual perception. David Ritter is a musician and an artist, born in 1979 in Oshawa, Ontario. He is a founding member of the alternative country band The Strumbellas, whose song “Spirits” went #1 in several countries, including number one for three weeks on the Alternative charts in the United States. It was certified Double Platinum in Canada and Italy, and Gold in the USA, France, and Germany, while gaining over one-hundred million streams and over fourty million views on YouTube. Their album Hope debuted at #3 on Billboard’s Folk Albums Chart, #9 on the Alternative Chart, and #12 on the Rock Albums Chart. The band made their U.S. network television debuts on Jimmy Kimmel Live, The Late Show With Stephen Colbert, and Conan with Conan O’Brien. They won a Juno for Single of the Year in 2016 and Roots and Traditional Album of the Year in 2014. This year they played festivals across North America and Europe including Bonnaroo, Governor’s Ball, Firefly, Lollapalooza, Osheaga, the Newport Folk Festival, British Summer Time, Pilgrimage, Life Is Beautiful, and Austin City Limits. Before the breakout success of The Strumbellas, David was pursuing his PhD in English at the University of Toronto and was a recipient of a Canada Graduate Scholarship. His dissertation was on character in 18th century history writing. His research interests include British and Canadian literature, historiography, the novel, and the intersection between sound and narrative. David K. Ross was born in 1966 in Weston, Ontario. Ross’ work is concerned with the processes and activities that enable cultural activities, infrastructural monuments and architectural structures to exist. His works have been exhibited in major institutions in North America and Europe and are included in private and public collections including the National Gallery of Canada, Ottawa; the Musée d’art contemporain de Montréal, and the Canadian Centre for Architecture, Montreal. His films and video installations have been featured at CineMarfa, Marfa, USA (2012); Le Mois de la Photo à Montréal (2013); the Graham Foundation for Advanced Studies in the Fine Arts, Chicago (2014); and in the Toronto International Film Festival, Wavelengths programme (2015). National Gallery of Canada, Ottawa. Purchased in 1992. These ten silver gelatin prints reveal the abandoned condition of the Expo 67 islands twenty-five years ago, depicting the barely visible traces of what remained of the site’s original pavilions and structures. Mark Ruwedel was born in the United States in 1954 and has become one of Canada’s most respected landscape photographers. Over Ruwedel’s three-decade career, he has perfected his technique of capturing landscapes where traces of human civilization meet the natural world. He is the winner of the 2014 Scotiabank Photography Award. This installation is a tribute to the Greek-French composer Iannis Xenakis’s radical 1960s-1970s Polytopes, the first of which premiered at Expo 67 in the French pavilion, now the Montréal Casino. Reconfigured here for the museum’s rotunda space, it consists of 126 powerful LEDs and many tiny speakers suspended throughout the space on a geometric “ruled surface” constructed of thin aircraft cable, creating a light and sound environment continually swinging between order and disorder, echoing Xenakis’s original fascination with the behaviours of natural systems. The installation is steered by means of a sensor network that uses machine learning techniques to “learn” different rhythmic and temporal patterns produced by the light and sound, and influences the overall compositional action over time. N-Polytope is by no means a recreation of Xenakis’s Polytopes, but rather a re-imagining that explores how Xenakis’s interest in probablistic (so-called “stochastic”) systems can be made sense of and kept alive today using new technologies that were unavailable to the composer during his lifetime. Chris Salter was born in Beaumont, Texas in 1967. Salter is an artist and University Research Chair in New Media, Technology and the Senses at Concordia University and Co-Director of the Milieux network for Research-Creation in Media Arts and Technology in Montreal. He studied philosophy and economics at Emory University and completed a PhD in directing and dramatic criticism at Stanford University where he also researched and studied at the Center for Computer Research in Music and Acoustics (CCMRA). His work has been seen all over the world at such venues as : Venice Architecture Biennale; Chronus Art Center, Shanghai; Vitra Design Museum, Weil am Rhein, Germany; HAU-Berlin Theater; Digital Art Biennial, Montreal (2014); LABoral, Gijón, Spain; Lille 3000, France; CTM Berlin; National Art Museum of China, Beijing; Ars Electronica, Linz, Austria; Villette Numerique, Paris; Todays Art, The Hague, Netherlands; Transmediale, Berlin; and EXIT Festival, Maison des Arts, Creteil-Paris among many others. He is the author of Entangled: Technology and the Transformation of Performance (MIT Press, 2010) and Alien Agency: Experimental Encounters with Art in the Making (MIT Press, 2015). Cheryl Sim’s parents spent part of their honeymoon at Expo 67, and their trip is documented in a scrapbook that the artist uses as a conduit through which to examine this time of innocence and excitement for the future as she wanders around the Expo site. 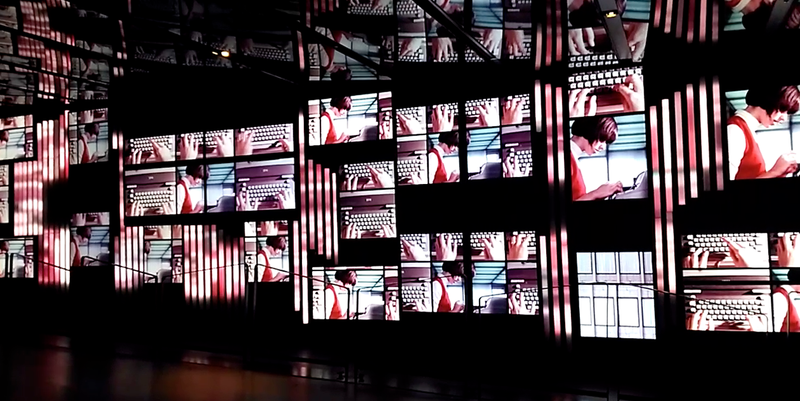 In her three-screen music video, Sim offers a new rendition of the original Expo 67 theme song “Un jour, un jour,” written by Stéphane Venne. Produced using both digital and analogue means and an electronic aesthetic, Sim’s otherworldly version prompts reflection and questioning. Similarly, the transformation of the designer outfits worn by Expo 67 hostesses into a one-piece jumpsuit evokes simultaneously the uniforms of parachutists, race car drivers and women who entered the manual work force, as well as the futuristic aesthetic of outer space. This change also raises questions about the utopian values inferred upon the jumpsuit as a great equalizer, transcending gender, race and class. Applying a critical, feminist perspective against a background of the situation in today’s world, Sim wonders how far have we come as a society and to what degree the dynamics of power have evolved over the last fifty years. This work is based on the original Expo 67 theme song, Un jour, un jour, words and music by Stéphane Venne. Cheryl Sim is a media artist, curator and musician. In her artistic production of single channel videos and media installations she investigates subjects tied to the formation of identity and power relations. She received her PhD from l’UQAM in 2015, where she undertook a Research-creation thesis entitled The Fitting Room: the Cheongsam and Canadian Women of Chinese Heritage in Installation. She performed The Thomas Wang Project at Oboro, Montreal, in the Festival Accès Asie in 2015. Charles Stankievech’s installation interfaces with the spectacular and enduring architecture of the United States of America Pavilion designed by Buckminster Fuller. Stankievech’s project engages with the entanglements of contradictory ideologies, from the evolution of Fuller’s geodesic domes as easily portable military structures in the Canadian Arctic to his counter-cultural turn of the late 1960s, and on to his contemporary legacy. Material in the exhibition comes from the following collections: NASA, Marg Wilkinson, Library and Archives Canada, R. Buckminster Fuller Collection at Stanford University, Buckminster Fuller Institute, Yukon Archives, BAR-1 DEW Line Archive, United States Department of Defense, IBM, K. Verlag, University of Toronto Libraries, MIT Lincoln Laboratory, Western Electric and Graeme Ferguson. Acknowledgments: The artist would like to thank the following for their assistance in research and production: Jayne Wilkinson, Marg Wilkinson, Marcin Kedzior, Graeme Ferguson, David McConville, Michèle Thériault at the Leonard & Bina Ellen Art Gallery at Concordia University, Anna Kovler, Camille Bédard, Martien deVletter, Meredith Carruthers, Johnny Bui, the graduate students in the Masters of Visual Studies program at the University of Toronto, and the John H. Daniels Faculty of Architecture, Landscape and Design, University of Toronto and CINEMAexpo67. Charles Stankievech, born 1978 in Okotoks, Alberta, is a Canadian artist whose research has explored issues such as the notion of “fieldwork” in the embedded landscape, the military industrial complex, and the history of technology. His diverse body of work has been shown internationally at the Louisiana Museum, Copenhagen, Denmark; Palais de Tokyo, Paris; Haus der Kulturen der Welt, Berlin; Massachusetts Museum of Contemporary Art, North Adams, USA; Musée d’art contemporain de Montréal, Canadian Centre for Architecture, Montreal; and the Venice Architecture and SITE Santa Fe Biennales. His lectures for dOCUMENTA (13) and the 8th Berlin Biennale were as much performance as pedagogy while his writing has been published by MIT and Princeton Architectural Press. Krista Belle Stewart’s work engages with the complexities of archival material. Her mother had been the subject of a CBC documentary entitled Seraphine: Her Own Story,1967, and Stewart undertook a search for any trace of her image that supposedly existed in another documentary on the Indians of Canada Pavilion. The freeze frame upon which this vinyl installation is based appears in the National Film Board of Canada film entitled Indian Memento, 1967. This remains one of the few existing moving image documents of the pavilion’s interior, and her mother’s portrait appears on the ceiling at the top of the photo arches. The portrait depicts a younger Seraphine, a nursing student, who later became the first Indigenous public health nurse in British Columbia. A window pane becomes a placard, acting as an interstice between documentary and the archival image, where intimacy leads to entanglement. Moving through these spaces requires guidance. Consider the land, the form, the colour, not as disconnected but as rooted. Krista Belle Stewart is a member of the Upper Nicola Band of the Okanagan Nation and a Vancouver-based artist. Her work approaches mediation and storytelling to unfold the interplay between personal and institutional history. She has exhibited at the Contemporary Art Gallery, Vancouver; Mercer Union, Toronto; and Esker Foundation, Calgary. The protagonist’s words are quotations from interviews with Monk, and internal correspondence from the Still Photography Division. The work also features poems commissioned from four emerging Montréal writers, and reflections written by cultural historians Andrea Kunard and Carol Payne. Althea Thauberger is an artist based in Vancouver. Her work typically involves interactions with a group or community and provocative reflections of social, political, institutional and aesthetic power relations. Her film and video installations are often the result of long-term negotiations and collaborations with those depicted ̶ such as religious choir members, tree planters, conscientious objectors and speakers of endangered languages and explore relationships between individualism, collectivism, and conformity. Thauberger’s projects additionally involve deep considerations of the histories of the sites of their production. These have included the Bohnice Psychiatric Hospital in Prague; the Kandahar Airfield, southern Afghanistan; the 200 block of Carrall Street in Vancouver’s Downtown Eastside; the Haskell Opera House on the Québec/Vermont border. Thauberger’s recent exhibitions and screenings have included The Power Plant, Toronto; Musée d’art contemporain de Montréal; Overgaden Institute of Contemporary Art, Copenhagen; the 2012 Liverpool Biennale; the occupied Kino Zvezda, Belgrade; and the Guangong Museum of Art.